Hey there! Thanks for dropping by New Found Place! Take a look around and grab the RSS feed to stay updated. See you around! I found some pasta in the kitchen but don’t want to have it with traditional tomato based sauce. I want something different. So I keep on digging and found the chinese sausage aka lap cheong in chinese. Hmmm… what should i do with these two? Cook the pasta according to the instruction. Usually will take about 13-15mins. Drain pasta and vegetables. Rinse with cold water and keep aside. Pour your badly beaten egg into the same frying pan and scramble it. 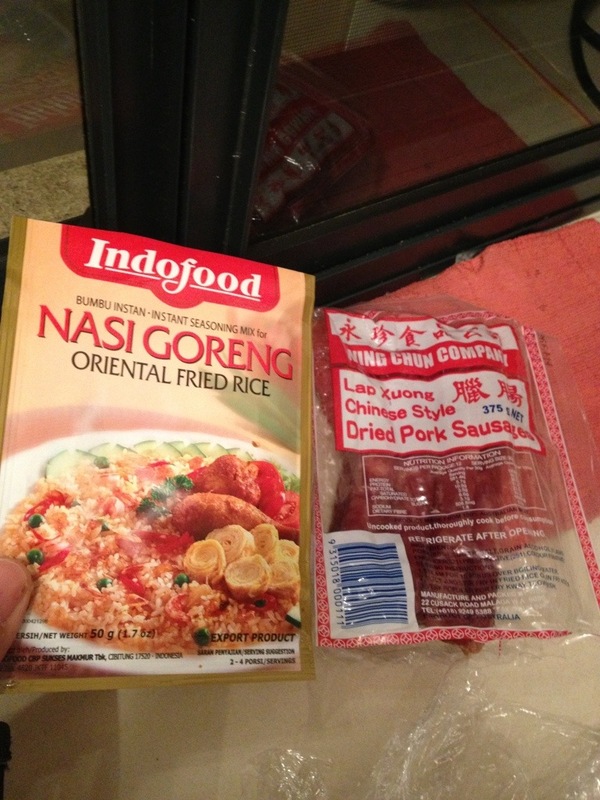 Chuck in 1 pack of Indofood Nasi Goreng first and mix it together with the chinese sausage. Wait till the sauce heat up. 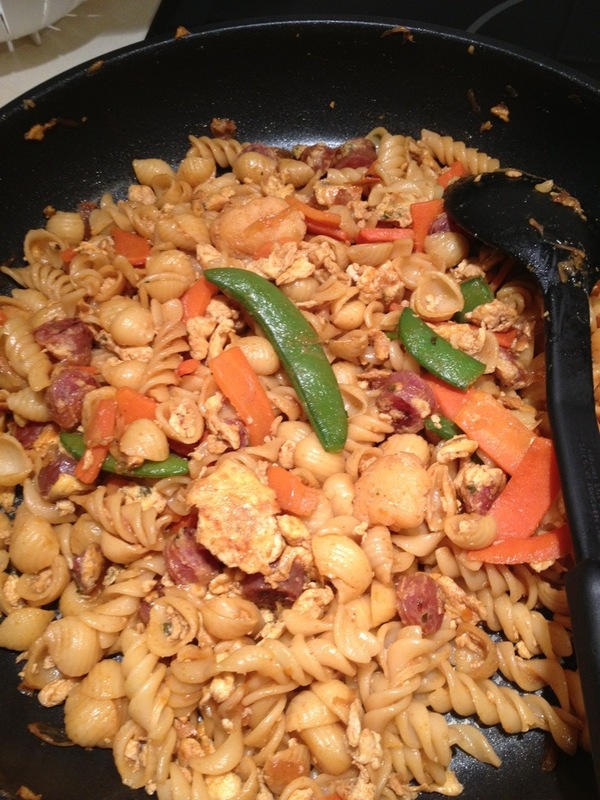 Throw all pasta and vegetables into the same frying pan and start stir fried it. Feel free to chuck in the remaining pack of Indofood Nasi Goreng and keep on stirring until everything blend together and balance. Tada… maybe the whole process took less than 30minutes and you made yourself stir fried pasta with chinese sausage and veges. Italian Meet Chinese! Okay how does it taste?! Errrmmm not as good as expected hahaha… but definitely edible!!! Definitely better than eating bread and vegemite for dinner. Maybe i’m just not a good cook. My partner like it. Went into the arcade after lunch wanting to have a coffee and bumped into this wonderful small cafe with warm and inviting set up. I like how they used the wood as the table top matches by small wooden chair which look really fragile. Since I am a big guy, I’m so worried that it will shattered into pieces by the time I sit on it annndddddd YES, it support my bum confidently. 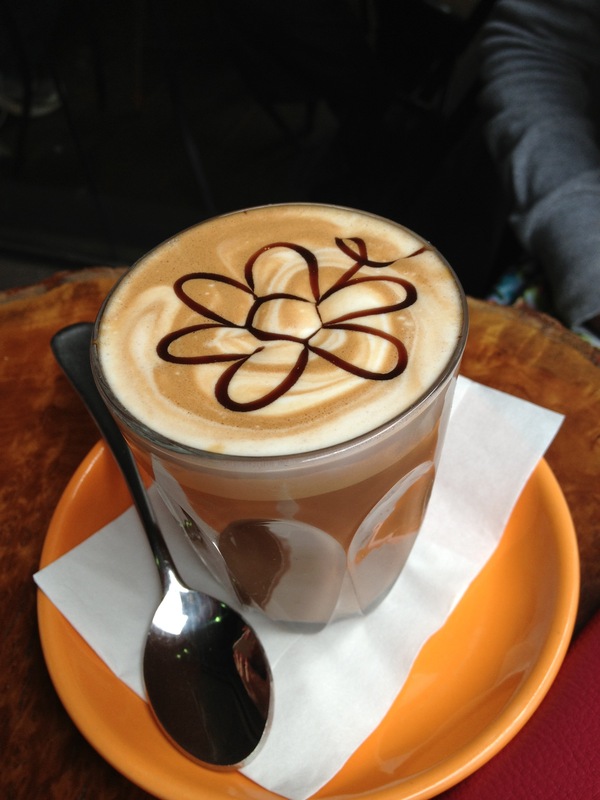 I ordered my coffee and i was surprised that the latte art turned out to be really good!!! Good job from the barista!!! 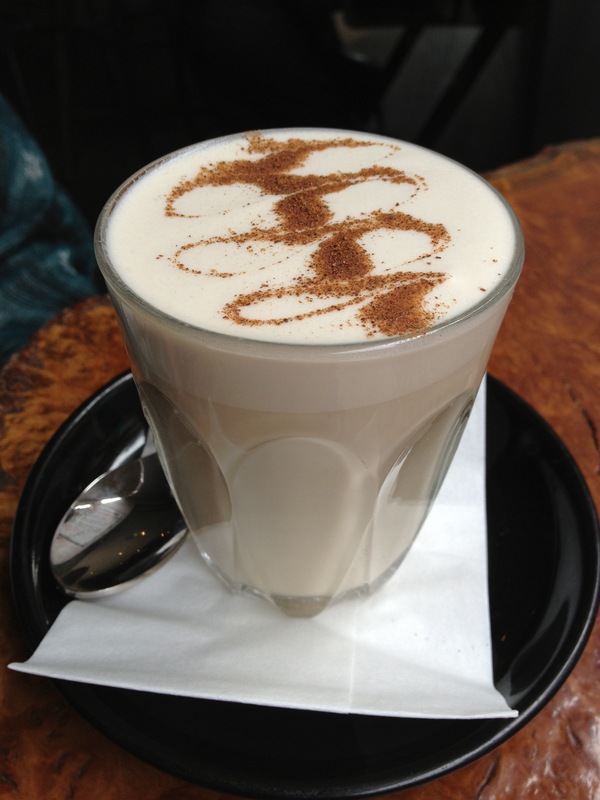 Ok latte art looks good and now how does it taste. I am not a professional coffee drinker so I can only judge by my personal preference. I had the long mac top up and I was quite disappointed with the milk density or smoothness or thickness or whatever you called it. The coffee was strong but it just a bit watery. But it was good, maybe I’m just being too harsh here and hopefully it wont make you think the McD coffee are better than them. Overall, the place is nice to hangout with friends especially when you are sitting outside under the nice weather and enjoying the back alley in the city with graffiti on the wall of the building and NO it’s not vandal grade graffiti that was done by the retard. It is the proper one. Haven’t got the chance to try their food but seems like there are a lot of good reviews on urbanspoon. Click here for The Bucket Cafe website. I will rate this place 3 out of 5. *Notes: When I was about to order my coffee, it come to my surprise that they actually sell “Kopi Luwak”. Coffee drinker should know what Kopi Luwak is. Kopi Luwak means Civet Coffee in Indonesia. It may sound interesting and yet triggering your curiosity for those who never heard of it. Click here to read more about Kopi Luwak. By this time, you should have read about Kopi Luwak and you might think “WTF or WTH? 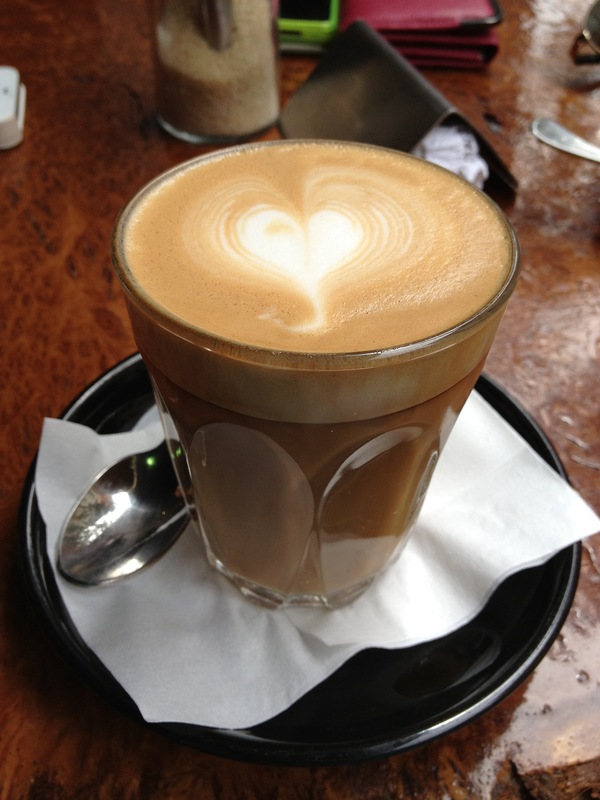 !” But don’t worry, it still taste like coffee. It cost me about US$10. Well you got to pay the premium for something that pop out from the civet isn’t it. I tried it once in Jakarta and I didn’t get any food poisoning or turning into civet or even giving me the idea to make some Human processed Coffee! Pork belly with chorizos is strongly recommended!!! Slurp slurp! The crispy pork skin/cracker and chorizos are the superstar for this dish. 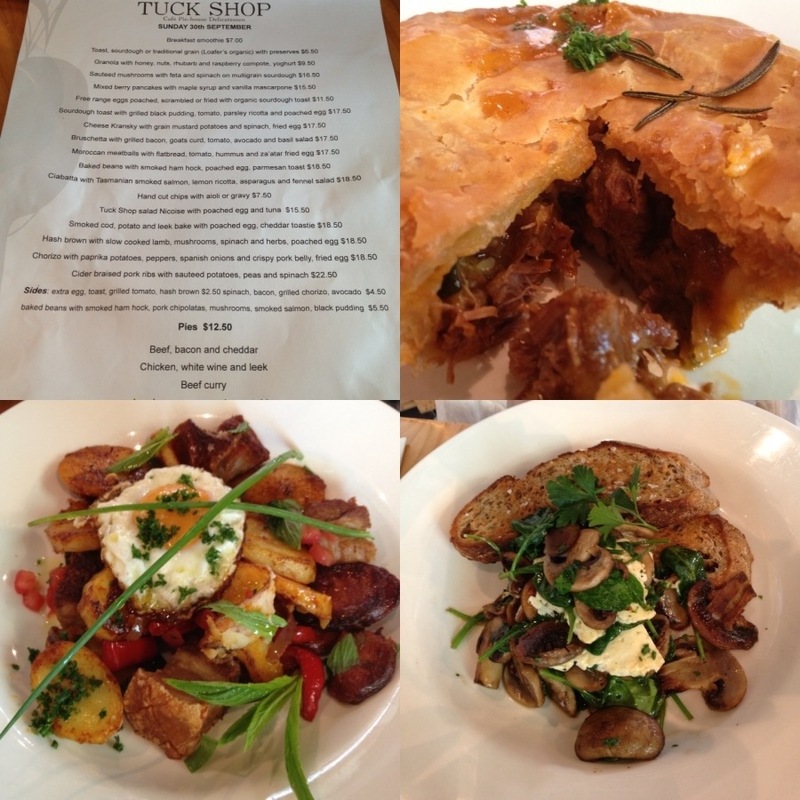 Lamb vege rosemary pie… yum yum yum. This is not an ordinary pie. Even Mrs Mac might regret for not trying this pie herself! When you bite into the succulent juicy lamb chunks, it turns into layers of soft meat. Ohhhhhh….. It goes so well with the pastry too! Portion is fulfilling as well for a big guy like me. Strawberry milkshake is another thing that worth to mention here. It does taste different compare to others. It does taste original and not artificial. You know what I mean… Like real strawberry juice blend with the milk. The place is small and can be quite busy so booking is recommended. click here for their Facebook page and contact details.